What is a .global Domain? With the .global domain, you can take your brand to an international level. The unique generic top-level domain was first made available in 2014. It was designed to help businesses reach a global audience. Whether your business is focused on providing products or services to the world at large, or you’re a non-profit that’s built on the idea of aiding communities around the globe, a .global domain can be a great option for you. In just a few years, tens of thousands of websites have been registered with this domain. It’s used by companies and individuals of all sizes. As a generic domain, there are no use restrictions or complex hurdles to overcome. The .global domain is accessible to anyone who wants to have a worldwide reach. Having an eye-catching domain like .global can make a huge difference in how your company is perceived by web users across the globe. Traditional .com and .org websites are a dime a dozen. The standard extension options don’t say much about who you are and what you plan to do with your brand. On the other hand, a .global domain automatically gives your website credibility. It’s a recognizable word that conveys an image of success and community. Many companies choose to utilize a .global domain once their business dealings surpass the confines of international borders. It’s often used for corporate websites that are designed for international visitors. Most territories outside of the United States have their own unique domains. It’s not uncommon for international users to ignore websites with traditional extensions due to country restrictions. If your websites are accessible to any web user, regardless of their location, having a .global domain can attract attention and help produce more traffic. Not only that, but a .global domain can also help to improve your site’s overall search engine optimization. The word “global” is right in the extension. It’s an important keyword that’s used by Internet users looking for international companies. With a .global domain, your website will appear higher on search results, ensuring that your digital space is visited by as many people as possible. Regardless of what type of content you host on your website, you can use the .global domain creatively to attract attention and create a memorable URL. The extension is easy to incorporate into domain hacking techniques. It can also be used to distinguish your international website from your domestic one. For example, say you have offices in locations around the world. A web address like CompanyName.global can be used to provide information about your company to international customers and guide them in the right direction to contact their local branch. The domain is also a popular choice for multi-national organizations. Many philanthropic entities who work with communities around the world utilize the domain creatively. For example, CommunityAid.global is a memorable URL that tells web users what your organization is all about before they even visit your website. 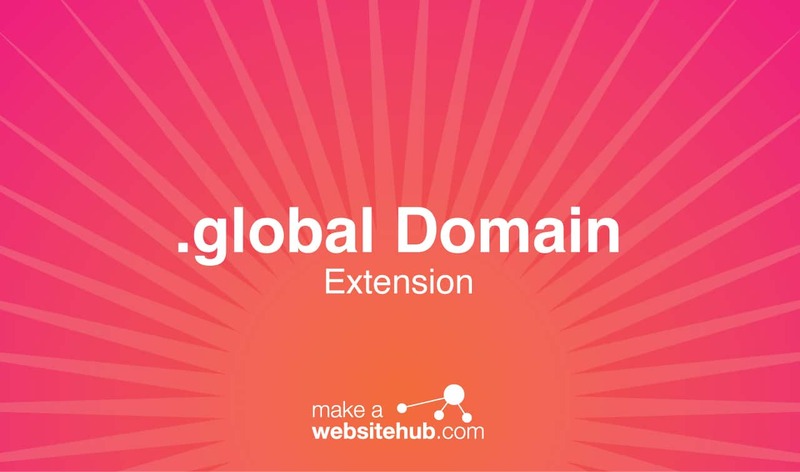 Where Can You Buy a .global Domain Extension? The .global domain is available from most major domain registrars. As mentioned earlier, there are no use restrictions. It can be registered by any company or individual. Check the following registrars out to register your domain.